There is a seemingly endless supply of swimming pool equipment and accessories. With so many options, it can be difficult to know where to start. Don’t let the options overwhelm you. By understanding the purpose of each option, you will be able to make choices that will make for a safer, more functional pool. There are many pool covers out there, but none work quite as well as a safety cover. This type of cover is designed to keep debris out of the pool while preventing any children or animals from falling through the cover into the pool as it permits a barrier to access. Safety covers have spring straps that are attached to anchors installed into the concrete around your pool. These covers must be professionally installed to ensure safety. Also, special anchors need to be utilized with pavers and wood decking. By installing a safety cover, you can protect your pool as well as your family. Pool lighting is another piece of swimming pool equipment and accessories that increases swimming pool functionality as well as safety. 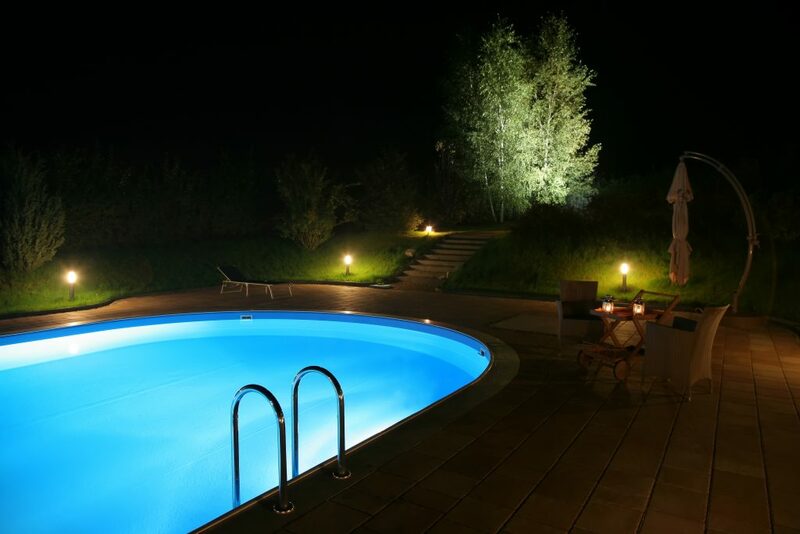 By installing lighting into your pool, you make it possible to swim safely at night.If night swimming, you want to make sure the entire pool, as well as surrounding decking is entirely lit. Attempting to swim at night without lighting is potentially dangerous and is not recommended. On top of safety, pool lighting adds ambiance to the pool. You can select the brightness, color, and style of each light to make a pool uniquely your own. As far as swimming pool equipment and accessories go, pool heaters are a great choice. 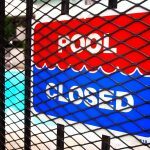 Unless you live in a very hot climate, swimming pool season can be short. A pool heater can turn a frigid pool into a comfortable one, no matter how cold it is outside. You can choose between natural gas or propane pool heaters as well as a heat pump. 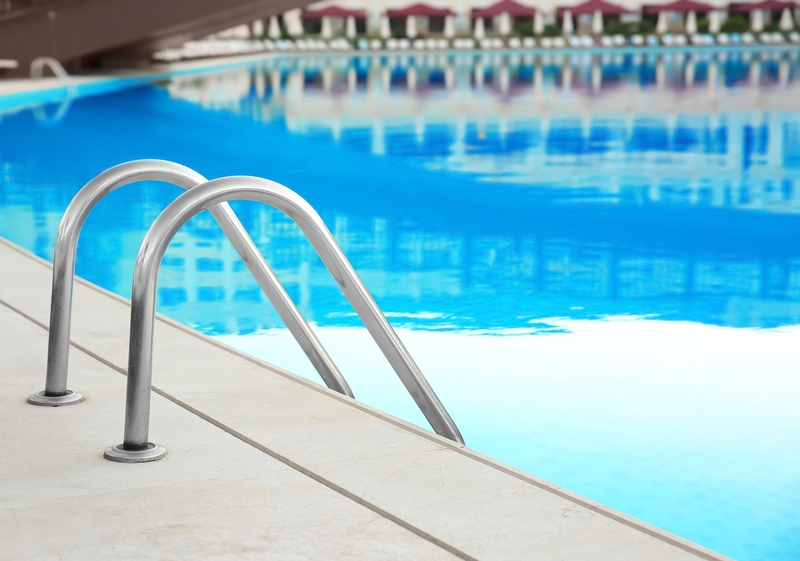 Natural gas or propane heaters work quickly and can warm a pool under any temperature. Heat pumps are less expensive but heat a pool slower and can only operate if the outdoor temperature is above 55 degrees Fahrenheit. To extend the swimming pool season, consider installing a heater. Swimming pool ladders and rails add an extra level of safety for swimmers. Typically, ladders are installed on the deep end of a pool. If swimmers get tired in the deep end, they can simply climb up the ladder instead of swimming all the way to the other side of the pool. This is especially helpful in situations where the swimmer is fatigued. Typically, pools have stairs on the shallow end of the pool. As one could probably guess, these stairs can be quite slippery. By installing rails along these steps, you can prevent someone from slipping while entering and exiting the pool. Ladders and rails rank among the most essential swimming pool equipment and accessories. Buying a pool thermometer is one of the least expensive pieces of swimming pool equipment and accessories, yet is extremely useful. 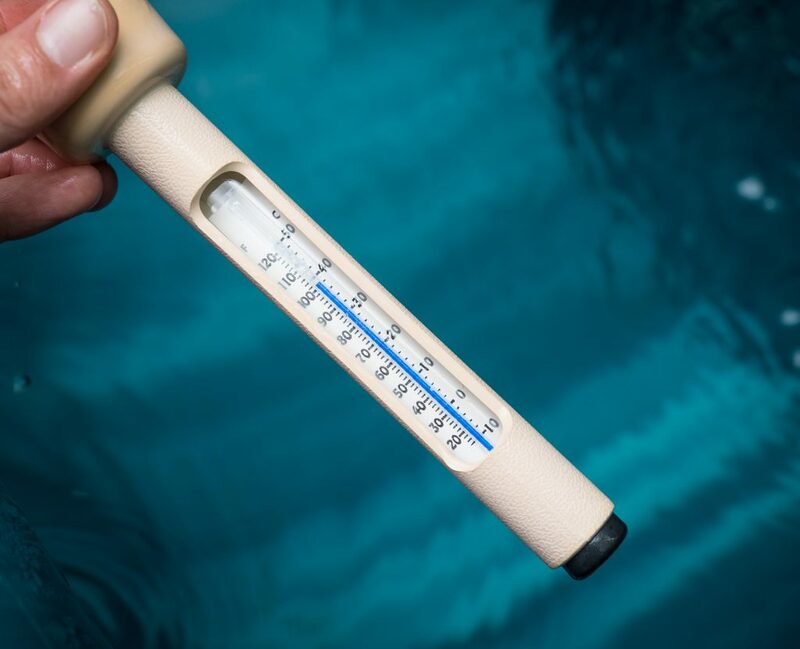 If you have a pool heater, you can use the thermometer to determine what the ideal temperature for comfortable swimming is. This helps eliminate guess work and can save money on energy bills. If you don’t have a pool heater, check the thermometer to see if the pool is warm enough to hop into. Above all else, the ultimate swimming pool accessory is a certified pool operator. Pool Operation Management offers award winning CPO certification courses that train you how to properly operate a swimming pool. 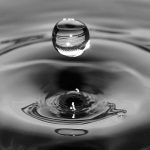 Our two-day courses offer a wealth of information and training in everything from pool chemicals to risk and liability. We can even send our own CPO certified technicians to your home or commercial pool for maintenance, inspections, and much more. For the very best in pool operation, contact us today.